The term Molecular biology was first used by Warren Weaver in 1938. Molecular biology is the study of molecular underpinnings of the processes of replication, transcription, translation, and cellular function. The term macromolecule was coined by Nobel laureate Hermann Staudinger in the 1920s, although his first relevant publication on this field only mentioned high molecular compounds (in excess of 1000 atoms). At that time the phrase polymer as introduced by Berzelius in 1833 had a different meaning from that of today: it simply was another form of isomerism, such as an enzene or acetylene, and had little to do with size. Some examples of organic macromolecules are bio-polymers (carbohydrates, proteins, lipids, nucleic acids) or polymers (plastics, synthetic fiber and rubber). A carbohydrate (kɑ:bəˈhaɪdreɪt/) is an organic compound which has the empirical formula Cm(H2O)n; that is, consists only of carbon, hydrogen and oxygen, with a hydrogen:oxygen atom ratio of 2:1 (as in water). Carbohydrates can be viewed as hydrates of carbon, hence their name. Structurally however, it is more accurate to view them as polyhydroxy aldehydes and ketones. Historically nutritionists have classified carbohydrates as either simple or complex, however, the exact delineation of these categories is ambiguous. Today, the term simple carbohydrate typically refers to monosaccharides and disaccharides, and complex carbohydrate means polysaccharides (and oligosaccharides). Monosaccharides (from Greek monos: single, sacchar: sugar) are the most basic units of biologically important carbohydrates. They are the simplest form of sugar and are usually colorless, water-soluble, crystalline solids. Some monosaccharides have a sweet taste. Examples of monosaccharides include glucose (dextrose), fructose (levulose), galactose, xylose and ribose. Monosaccharides are the building blocks of disaccharides such as sucrose and polysaccharides (such as cellulose and starch). Further, each carbon atom that supports a hydroxyl group (except for the first and last) is chiral, giving rise to a number of isomeric forms all with the same chemical formula. For instance, galactose and glucose are both aldohexoses, but have different chemical and physical properties. A disaccharide or biose is the carbohydrate formed when two monosaccharides undergo a condensation reaction which involves the elimination of a small molecule, such as water, from the functional groups only. Like monosaccharides, disaccharides also dissolve in water, taste sweet and are called sugars. The glycosidic bond can be formed between any hydroxyl group on the component monosaccharide. So, even if both component sugars are the same (e.g., glucose), different bond combinations (regiochemistry) and stereochemistry (alpha- or beta-) result in disaccharides that are diastereoisomers with different chemical and physical properties. Depending on the monosaccharide constituents, disaccharides are sometimes crystalline, sometimes water-soluble, and sometimes sweet-tasting and sticky-feeling. An oligosaccharide (from the Greek oligos, a few, and sacchar, sugar) is a saccharide polymer containing typically three to ten component sugars, also known as many as 8 sugars, or polysaccharides. Oligosaccharides can have many functions; for example, they are commonly found on the plasma membrane of animal cells where they can play a role in cell-cell recognition. In general, they are found either O- or N-linked to compatible amino acid side-chains in proteins or to lipid moieties. e.g.Fructo-oligosaccharides (FOS), which are found in many vegetables, consist of short chains of fructose molecules. (Inulin has a much higher degree of polymerization than FOS and is a polysaccharide.) Galactooligosaccharides (GOS), which also occur naturally, consist of short chains of galactose molecules. These compounds can be only partially digested by humans. Polysaccharides are polymeric carbohydrate structures, formed of repeating units (either mono- or di-saccharides) joined together by glycosidic bonds. These structures are often linear, but may contain various degrees of branching. Polysaccharides are often quite heterogeneous, containing slight modifications of the repeating unit. Depending on the structure, these macromolecules can have distinct properties from their monosaccharide building blocks. They may be amorphous or even insoluble in water.Starches are glucose polymers in which glucopyranose units are bonded by alpha-linkages. It is made up of a mixture of Amylose (15–20%) and Amylopectin (80–85%). Amylose consists of a linear chain of several hundred glucose molecules and Amylopectin is a branched molecule made of several thousand glucose units (every chain 24–30 glucose unit). Starches are insoluble in water. They can be digested by hydrolysis, catalyzed by enzymes called amylases, which can break the alpha-linkages (glycosidic bonds). Humans and other animals have amylases, so they can digest starches. Potato, rice, wheat, and maize are major sources of starch in the human diet. The formation of starches are the way that plants store glucose.Glycogen is a polysaccharide that is found in animals and is composed of a branched chain of glucose residues. It is stored in liver and muscles.Chitin is one of many naturally occurring polymers. It is one of the most abundant natural materials in the world. Over time it is bio-degradable in the natural environment. Its breakdown may be catalyzed by enzymes called chitinases, secreted by microorganisms such as bacteria and fungi, and produced by some plants.Arabinoxylans are the copolymers of two pentose sugars - arabinose and xylose. Proteins are polymer of amino acids linked together by peptide bonds. Amino acids can be divided into two group essential amino acids and non-essential amino acids. Proteins and carbohydrates contain 4 kcal/gram as opposed to lipids which contain 9 kcal/ gram. The liver, and to a much lesser extent the kidneys, can convert amino acids used by cells in protein biosynthesis into glucose by a process known as gluconeogenesis. The essential amino acids, which must be obtained from external sources (food), are leucine, isoleucine, valine, lysine, threonine, tryptophan, methionine, phenylalanine and histidine. On the other hand, non-essential amino acids are synthesized in our body from other amino acids. The non-essential amino acids are arginine, alanine, asparagine, aspartic acid, cysteine, glutamine, glutamic acid, glycine, proline, serine, and tyrosine. Proteins( /ˈproʊtiːnz/; also known as polypeptides) are organic compounds made of amino acids arranged in a linear chain and folded into a globular or fibrous form. The amino acids in a polymer are joined together by the peptide bonds between the carboxyl and amino groups of adjacent amino acid residues. The sequence of amino acids in a protein is defined by the sequence of a gene, which is encoded in the genetic code.Proteins were first described by the Dutch chemist Gerhardus Johannes Mulder and named by the Swedish chemist Jöns Jakob Berzelius in 1838. Lipids are a broad group of naturally occurring molecules which includes fats, waxes, sterols, fat-soluble vitamins (such as vitamins A, D, E and K), monoglycerides, diglycerides, phospholipids, and others. The main biological functions of lipids include energy storage, as structural components of cell membranes, and as important signaling molecules. Cell contain near about 70% of water. Lipids in membrane Eukaryotic cells are compartmentalized into membrane-bound organelles which carry out different biological functions. The glycerophospholipids are the main structural component of biological membranes, such as the cellular plasma membrane and the intracellular membranes of organelles; in animal cells the plasma membrane physically separates the intracellular components from the extracellular environment. The glycerophospholipids are amphipathic molecules (containing both hydrophobic and hydrophilic regions) that contain a glycerol core linked to three fatty acid-derived "tails" by ester linkages and to one "head" group by a phosphate ester linkage. While glycerophospholipids are the major component of biological membranes, other non-glyceride lipid components such as sphingomyelin and sterols (mainly cholesterol in animal cell membranes) are also found in biological membranes. In plants and algae, the galactosyldiacylglycerols, and sulfoquinovosyldiacylglycerol, which lack a phosphate group, are important components of membranes of chloroplasts and related organelles and are the most abundant lipids in photosynthetic tissues, including those of higher plants, algae and certain bacteria. Bilayers have been found to exhibit high levels of birefringence which can be used to probe the degree of order (or disruption) within the bilayer using techniques such as dual polarisation interferometry. A biological membrane is a form of lipid bilayer. The formation of lipid bilayers is an energetically preferred process when the glycerophospholipids described above are in an aqueous environment. In an aqueous system, the polar heads of lipids align towards the polar, aqueous environment, while the hydrophobic tails minimize their contact with water and tend to cluster together, forming a vesicle; depending on the concentration of the lipid, this biophysical interaction may result in the formation of micelles, liposomes, or lipid bilayers. Other aggregations are also observed and form part of the polymorphism of amphiphile (lipid) behavior. Phase behavior is an area of study within biophysics and is the subject of current academic research. Micelles and bilayers form in the polar medium by a process known as the hydrophobic effect. When dissolving a lipophilic or amphiphilic substance in a polar environment, the polar molecules (i.e., water in an aqueous solution) become more ordered around the dissolved lipophilic substance, since the polar molecules cannot form hydrogen bonds to the lipophilic areas of the amphiphile. So in an aqueous environment, the water molecules form an ordered "clathrate" cage around the dissolved lipophilic molecule. In recent years, evidence has emerged showing that lipid signaling is a vital part of the cell signaling. Lipid signaling may occur via activation of G protein-coupled or nuclear receptors, and members of several different lipid categories have been identified as signaling molecules and cellular messengers. These include sphingosine-1-phosphate, a sphingolipid derived from ceramide that is a potent messenger molecule involved in regulating calcium mobilization, cell growth, and apoptosis; diacylglycerol (DAG) and the phosphatidylinositol phosphates (PIPs), involved in calcium-mediated activation of protein kinase C; the prostaglandins, which are one type of fatty-acid derived eicosanoid involved in inflammation and immunity; the steroid hormones such as estrogen, testosterone and cortisol, which modulate a host of functions such as reproduction, metabolism and blood pressure; and the oxysterols such as 25-hydroxy-cholesterol that are liver X receptor agonists. We know water is essential to all life as we know it so much so that every cell is nearly 70% of water. We also know that one molecule of water is made up of two hydrogen (H) atoms which are covalently bonded to a single oxygen(O) atom (water's chemical formula H2O). A noncovalent bond is a type of chemical bond, typically between macromolecules, that does not involve the sharing of pairs of electrons, but rather involves more dispersed variations of electromagnetic interactions. The noncovalent bond is the dominant type of bond between supermolecules in supermolecular chemistry. Noncovalent bonds are critical in maintaining the three-dimensional structure of large molecules, such as proteins and nucleic acids, and are involved in many biological processes in which large molecules bind specifically but transiently to one another. The energy released in the formation of noncovalent bonds is on the order of 1-5 kcal per mol. There are four commonly mentioned types of non-covalent interactions: hydrogen bonds, ionic bonds, van der Waals forces, and hydrophobic interactions. The noncovalent interactions hold together the two strands of DNA in the double helix, stabilize secondary and tertiary structures of proteins, and enable enzyme-substrate binding and antibody-antigen association. The best example of a hydrogen bond is found between water molecules.Water molecules contains two hydrogen atoms and one oxygen atom.Two molecules of water can form a hydrogen bond between them. Inside the cell hydrogen bonding also plays an important role in determining the 3D structures of proteins and nucleic bases. In these macromolecules, bonding between parts of the same macromolecule cause it to fold into a specific shape, which helps determine the molecule's physiological or biochemical function. The double helical structure of DNA, for example, is due to hydrogen bonding between the base pairs, which link one complementary strand to the other and enable replication.Hydrogen bonds are also important in the structure of macromolecule cellulose. We should also remember that the hydrogen bond is stronger than a van der Waals interaction, but generally weaker than ionic bonds. As we know very well in chemistry, pH is a measure of the acidity or basicity of an aqueous solution. Pure water is said to be neutral, with a pH close to 7.0 at 25 °C (77 °F). Solutions with a pH less than 7 are said to be acidic and solutions with a pH greater than 7 are basic or alkaline. pH measurements are important in medicine, biology, chemistry, food science, environmental science, oceanography, civil engineering and many other applications. In a solution pH approximates but is not equal to p[H], the negative logarithm (base 10) of the molar concentration of dissolved hydronium ions (H3O+); a low pH indicates a high concentration of hydronium ions, while a high pH indicates a low concentration. Crudely, this negative of the logarithm matches the number of places behind the decimal point, so for example 0.1 molar hydrochloric acid should be near pH 1 and 0.0001 molar HCl should be near pH 4 (the base 10 logarithms of 0.1 and 0.0001 being −1, and −4, respectively). Pure (de-ionised) water is neutral, and can be considered either a very weak acid or a very weak base (center of the 0 to 14 pH scale), giving it a pH of 7 (at 25 °C (77 °F)), or 0.0000001 M H+. For an aqueous solution to have a higher pH, a base must be dissolved in it, which binds away many of these rare hydrogen ions. Hydrogen ions in water can be written simply as H+ or as hydronium (H3O+) or higher species (e.g. H9O4+) to account for solvation, but all describe the same entity. Most of the Earth's freshwater surface bodies are slightly acidic due to the abundance and absorption of carbon dioxide; in fact, for millennia in the past most fresh water bodies have long existed at a slightly acidic pH level. However, pH is not precisely p[H], but takes into account an activity factor. This represents the tendency of hydrogen ions to interact with other components of the solution, which affects among other things the electrical potential read using a pH meter. As a result, pH can be affected by the ionic strength of a solution – for example, the pH of a 0.05 M potassium hydrogen phthalate solution can vary by as much as 0.5 pH units as a function of added potassium chloride, even though the added salt is neither acidic nor basic.pH also play important role in living organism. The cell is the functional basic unit of life. It was discovered by Robert Hooke and is the functional unit of all known living organisms. It is the smallest unit of life that is classified as a living thing, and is often called the building block of life. Some organisms, such as most bacteria, are unicellular (consist of a single cell). Other organisms, such as humans and birds, are multicellular. Humans have about 100 trillion or 1014 cells; a typical cell size is 10 µm and a typical cell mass is 1 nanogram. The largest cells are about 135 µm in the anterior horn in the spinal cord while granule cells in the cerebellum, the smallest, can be some 4 µm and the longest cell can reach from the toe to the lower brain stem (Pseudounipolar cells). The largest known cells are unfertilised ostrich egg cells which weigh 3.3 pounds. In 1835, before the final cell theory was developed, Jan Evangelista Purkyně observed small "granules" while looking at the plant tissue through a microscope. The cell theory, first developed in 1839 by Matthias Jakob Schleiden and Theodor Schwann, states that all organisms are composed of one or more cells, that all cells come from preexisting cells, that vital functions of an organism occur within cells, and that all cells contain the hereditary information necessary for regulating cell functions and for transmitting information to the next generation of cells. The word cell comes from the Latin cellula, meaning, a small room. The descriptive term for the smallest living biological structure was coined by Robert Hooke in a book he published in 1665 when he compared the cork cells he saw through his microscope to the small rooms monks lived in.There are two types of cells: eukaryotic and prokaryotic. Prokaryotic cells are usually independent, while eukaryotic cells are often found in multicellular organisms. Earth's early atmosphere Some evidence suggests that Earth's original atmosphere might have contained fewer of the reducing molecules than was thought at the time of the Miller–Urey experiment. There is abundant evidence of major volcanic eruptions 4 billion years ago, which would have released carbon dioxide, nitrogen, hydrogen sulfide (H2S), and sulfur dioxide (SO2) into the atmosphere. Experiments using these gases in addition to the ones in the original Miller–Urey experiment have produced more diverse molecules. The experiment created a mixture that was racemic (containing both L and D enantiomers) and experiments since have shown that "in the lab the two versions are equally likely to appear." However, in nature, L amino acids dominate; later experiments have confirmed disproportionate amounts of L or D oriented enantiomers are possible. Conditions similar to those of the Miller–Urey experiments are present in other regions of the solar system, often substituting ultraviolet light for lightning as the energy source for chemical reactions. The Murchison meteorite that fell near Murchison, Victoria, Australia in 1969 was found to contain over 90 different amino acids, nineteen of which are found in Earth life. Comets and other icy outer-solar-system bodies are thought to contain large amounts of complex carbon compounds (such as tholins) formed by these processes, darkening surfaces of these bodies. The early Earth was bombarded heavily by comets, possibly providing a large supply of complex organic molecules along with the water and other volatiles they contributed. This has been used to infer an origin of life outside of Earth: the panspermia hypothesis. The Miller and Urey experiment (or Urey–Miller experiment) was an experiment that simulated hypothetical conditions thought at the time to be present on the early Earth, and tested for the occurrence of chemical origins of life. Specifically, the experiment tested Alexander Oparin's and J. B. S. Haldane's hypothesis that conditions on the primitive Earth favored chemical reactions that synthesized [organic compounds from inorganic precursors. Considered to be the classic experiment on the origin of life, it was conducted in 1952 and published in 1953 by Stanley Miller and Harold Urey at the University of Chicago. As observed in all subsequent experiments, both left-handed (L) and right-handed (D) optical isomers were created in a racemic mixture. Other experiments This experiment inspired many others. In 1961, Joan Oró found that the nucleotide base adenine could be made from hydrogen cyanide (HCN) and ammonia in a water solution. His experiment produced a large amount of adenine, which molecules were formed from 5 molecules of HCN. Also, many amino acids are formed from HCN and ammonia under these conditions. Experiments conducted later showed that the other RNA and DNA nucleobases could be obtained through simulated prebiotic chemistry with a reducing atmosphere. More recent experiments by chemist Jeffrey Bada atScripps Institution of Oceanography (in La Jolla, CA) were similar to those performed by Miller. However, Bada noted that in current models of early Earth conditions, carbon dioxide and nitrogen (N2) create nitrite]s, which destroy amino acids as fast as they form. However, the early Earth may have had significant amounts of iron and carbonate minerals able to neutralize the effects of the nitrites. When Bada performed the Miller-type experiment with the addition of iron and carbonate minerals, the products were rich in amino acids. This suggests the origin of significant amounts of amino acids may have occurred on Earth even with an atmosphere containing carbon dioxide and nitrogen. Prokaryotes are single-cell organisms that do not have a nucleus, mitochondria, or any other membrane-bound organelles. In other words, neither their DNA nor any of their other sites of metabolic activity are collected together in a discrete membrane-enclosed area. Instead, everything is openly accessible within the cell, some of which is free-floating. A distinction between prokaryotes and eukaryotes (meaning true kernel, also spelled "eucaryotes") is that eukaryotes do have "true" nuclei containing their DNA. Unlike prokaryotes, eukaryotic organisms may be unicellular, as in amoebae, or multicellular, as in plants and animals. The difference between the structure of prokaryotes and eukaryotes is so great that it is sometimes considered to be the most important distinction among groups of organisms. The cell structure of prokaryotes differs greatly from that of eukaryotes. The defining characteristic is the absence of a nucleus. Also the size of Ribosomes in prokaryotes is smaller than that in eukaryotes, which is now where respiration takes place. The genomes of prokaryotes are held within an irregular DNA/protein complex in the cytosol called the nucleoid, which lacks a nuclear envelope. In general, prokaryotes lack the following membrane-bound cell compartments: mitochondria and chloroplasts. Instead, processes such as oxidative phosphorylation and photosynthesis take place across the prokaryotic plasma membrane. However, prokaryotes do possess some internal structures, such as cytoskeletons, and the bacterial order Planctomycetes have a membrane around their nucleoid and contain other membrane-bound cellular structures. Both eukaryotes and prokaryotes contain large RNA/protein structures called ribosomes, which produce protein. Prokaryotes are usually much smaller than eukaryotic cells. Prokaryotes also differ from eukaryotes in that they contain only a single loop of stable chromosomal DNA stored in an area named the nucleoid, whereas eukaryote DNA is found on tightly bound and organized chromosomes. Although some eukaryotes have satellite DNA structures called plasmids, in general these are regarded as a prokaryote feature, and many important genes in prokaryotes are stored on plasmids. Prokaryotes have a larger surface-area-to-volume ratio giving them a higher metabolic rate, a higher growth rate, and, as a consequence, a shorter generation time compared to Eukaryotes. A criticism of this classification is that the word "prokaryote" is based on what these organisms are not (they are not eukaryotic), rather than what they are (either archaea or bacteria). In 1977, Carl Woese proposed dividing prokaryotes into the Bacteria and Archaea (originally Eubacteria and Archaebacteria) because of the major differences in the structure and genetics between the two groups of organisms. This arrangement of Eukaryota (also called "Eukarya"), Bacteria, and Archaea is called the three-domain system, replacing the traditional two-empire system. The origin of the eukaryotic cell was a milestone in the evolution of life, since they include all complex cells and almost all multi-cellular organisms. The timing of this series of events is hard to determine; Knoll (2006) suggests they developed approximately 1.6 – 2.1 billion years ago. Some acritarchs are known from at least 1,650 million years ago, and the possible alga Grypania has been found as far back as 2,100 million years ago. Fossils that are clearly related to modern groups start appearing around 1.2 billion years ago, in the form of a red alga, though recent work suggests the existence of fossilized filamentous algae in the Vindhya basin dating back to 1.6 to 1.7 billion years ago. Biomarkers suggest that at least stem eukaryotes arose even earlier. The presence of steranes in Australian shales indicates that eukaryotes were present 2.7 billion years ago. Plant cells are quite different from the cells of the other eukaryotic organisms. Their distinctive features are: A large central vacuole (enclosed by a membrane, the tonoplast), which maintains the cell's turgor and controls movement of molecules between the cytosol and sap A primary cell wall containing cellulose, hemicellulose and pectin, deposited by the protoplast on the outside of the cell membrane; this contrasts with the cell walls of fungi, which contain chitin, and the cell envelopes of prokaryotes, in which peptidoglycans are the main structural molecules The plasmodesmata, linking pores in the cell wall that allow each plant cell to communicate with other adjacent cells; this is different from the functionally analogous system of gap junctions between animal cells. Plastids, especially chloroplasts that contain chlorophyll, the pigment that gives plants their green color and allows them to perform photosynthesis Higher plants, including conifers and flowering plants (Angiospermae) lack the flagellae and centrioles that are present in animal cells. Fungal cells are most similar to animal cells, with the following exceptions: A cell wall that contains chitin Less definition between cells; the hyphae of higher fungi have porous partitions called septa, which allow the passage of cytoplasm, organelles, and, sometimes, nuclei. Primitive fungi have few or no septa, so each organism is essentially a giant multinucleate supercell; these fungi are described as coenocytic. Only the most primitive fungi, chytrids, have flagella. Other eukaryotic cells Eukaryotes are a very diverse group, and their cell structures are equally diverse. Many have cell walls; many do not. Many have chloroplasts, derived from primary, secondary, or even tertiary endosymbiosis; and many do not. Some groups have unique structures, such as the cyanelles of the glaucophytes, the haptonema of the haptophytes, or the ejectisomes of the cryptomonads. Other structures, such as pseudopods, are found in various eukaryote groups in different forms, such as the lobose amoebozoans or the reticulose foraminiferans. Plant cells are eukaryotic cells that differ in several key respects from the cells of other eukaryotic organisms. Their distinctive features include: A large central vacuole, a water-filled volume enclosed by a membrane known as the tonoplast maintains the cell's turgor, controls movement of molecules between the cytosol and sap, stores useful material and digests waste proteins and organelles. A cell wall composed of cellulose and hemicellulose, pectin and in many cases lignin, are secreted by the protoplast on the outside of the cell membrane. This contrasts with the cell walls of fungi (which are made of chitin), and of bacteria, which are made of peptidoglycan. Specialised cell-cell communication pathways known as plasmodesmata, pores in the primary cell wall through which the plasmalemma and endoplasmic reticulum of adjacent cells are continuous. Plastids, the notables one being the chloroplasts, which contain chlorophyll and the biochemical systems for light harvesting and photosynthesis, but also amyloplasts specialized for starch storage, elaioplasts specialized for fat storage, and chromoplasts specialized for synthesis and storage of pigments. As in mitochondria, which have a genome encoding 37 genes, plastids have their own genomes of about 100-120 unique genes and, it is presumed, arose as prokaryotic endosymbionts living in the cells of an early eukaryotic ancestor of the land plants and algae. Unlike animal cells, plant cells are stationary. Cell division by construction of a phragmoplast as a template for building a cell plate late in cytokinesis is characteristic of land plants and a few groups of algae, the notable one being the Charophytes and the Order Trentepohliales. The sperm of bryophytes have flagellae similar to those in animals,but higher plants, (including Gymnosperms and flowering plants) lack the flagellae and centrioles that are present in animal cells. The endosymbiotic (from the Greek: endo- meaning inside and -symbiosis meaning cohabiting) theory was first articulated by the Russian botanist Konstantin Mereschkowski in 1905. Mereschkowski was familiar with work by botanist Andreas Schimper, who had observed in 1883 that the division of chloroplasts in green plants closely resembled that of free-living cyanobacteria, and who had himself tentatively proposed (in a footnote) that green plants had arisen from a symbiotic union of two organisms. Ivan Wallin extended the idea of an endosymbiotic origin to mitochondria in the 1920s.These theories were initially dismissed or ignored. More detailed electron microscopic comparisons between cyanobacteria and chloroplasts (for example studies by Hans Ris), combined with the discovery that plastids and mitochondria contain their own DNA (which by that stage was recognized to be the hereditary material of organisms) led to a resurrection of the idea in the 1960s. The endosymbiotic theory was advanced and substantiated with microbiological evidence by Lynn Margulis in a 1967 paper, The Origin of Mitosing Eukaryotic Cells. In her 1981 work Symbiosis in Cell Evolution she argued that eukaryotic cells originated as communities of interacting entities, including endosymbiotic spirochaetes that developed into eukaryotic flagella and cilia. This last idea has not received much acceptance, because flagella lack DNA and do not show ultrastructural similarities to bacteria or archaea. According to Margulis and Dorion Sagan, "Life did not take over the globe by combat, but by networking" (i.e., by cooperation). The possibility that peroxisomes may have an endosymbiotic origin has also been considered, although they lack DNA. Christian de Duve proposed that they may have been the first endosymbionts, allowing cells to withstand growing amounts of free molecular oxygen in the Earth's atmosphere. However, it now appears that they may be formed de novo, contradicting the idea that they have a symbiotic origin. It is believed that over millennia these endosymbionts transferred some of their own DNA to the host cell's nucleus during the evolutionary transition from a symbiotic community to an instituted eukaryotic cell (called "serial endosymbiosis"). This hypothesis is thought to be possible because it is known today from scientific observation that transfer of DNA occurs between bacteria species, even if they are not closely related. Bacteria can take up DNA from their surroundings and have a limited ability to incorporate it into their own genome. 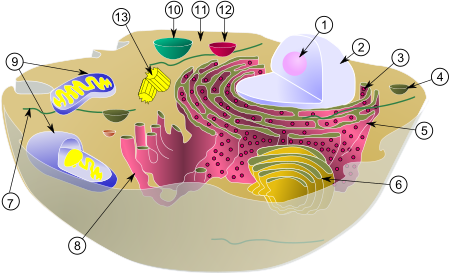 Eukaryotes are one of the structurally complex cell type, and by definition are in part organized by smaller interior compartments, that are themselves enclosed by lipid membranes that resemble the outermost cell membrane. The larger organelles, such as the nucleus and vacuoles, are easily visible with the light microscope. They were among the first biological discoveries made after the invention of the microscope. Not all eukaryotic cells have each of the organelles listed below. 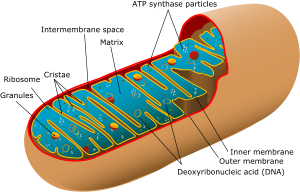 Exceptional organisms have cells which do not include some organelles that might otherwise be considered universal to eukaryotes (such as mitochondria). There are also occasional exceptions to the number of membranes surrounding organelles, listed in the tables below (e.g., some that are listed as double-membrane are sometimes found with single or triple membranes). 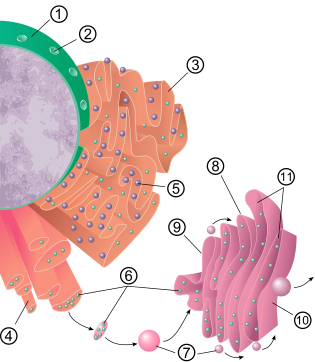 In addition, the number of individual organelles of each type found in a given cell varies depending upon the function of that cell. HeLa cells stained for DNA with the Blue Hoechst dye. The central and rightmost cell are in interphase, thus their entire nuclei are labeled. On the left, a cell is going through mitosis and its DNA has condensed ready for division. Autophagosomes labeled by a fluorescent marker. Prokaryotes are not as structurally complex as eukaryotes, and were once thought not to have any internal structures enclosed by lipid membranes. In the past, they were often viewed as having little internal organization; but, slowly, details are emerging about prokaryotic internal structures. An early false turn was the idea developed in the 1970s that bacteria might contain membrane folds termed mesosomes, but these were later shown to be artifacts produced by the chemicals used to prepare the cells for electron microscopy. However, more recent research has revealed that at least some prokaryotes have microcompartments such as carboxysomes. These subcellular compartments are 100 - 200 nm in diameter and are enclosed by a shell of proteins. Even more striking is the description of membrane-bound magnetosomes in bacteria, as well as the nucleus-like structures of the Planctomycetes that are surrounded by lipid membranes. Cell membranes contain a variety of biological molecules, notably lipids and proteins. Material is incorporated into the membrane, or deleted from it, by a variety of mechanisms: Fusion of intracellular vesicles with the membrane (endocytosis) not only excretes the contents of the vesicle but also incorporates the vesicle membrane's components into the cell membrane. The membrane may form blebs around extracellular material that pinch off to become vesicles (exocytosis). If a membrane is continuous with a tubular structure made of membrane material, then material from the tube can be drawn into the membrane continuously. Although the concentration of membrane components in the aqueous phase is low (stable membrane components have low solubility in water), there is an exchange of molecules between the lipid and aqueous phases. The cell membrane consists of three classes of amphipathic lipids: phospholipids, glycolipids, and cholesterols. The amount of each depends upon the type of cell, but in the majority of cases phospholipids are the most abundant. In RBC studies, 30% of the plasma membrane is lipid. The fatty chains in phospholipids and glycolipids usually contain an even number of carbon atoms, typically between 16 and 20. The 16- and 18-carbon fatty acids are the most common. Fatty acids may be saturated or unsaturated, with the configuration of the double bonds nearly always cis. The length and the degree of unsaturation of fatty acid chains have a profound effect on membrane fluidity as unsaturated lipids create a kink, preventing the fatty acids from packing together as tightly, thus decreasing the melting temperature (increasing the fluidity) of the membrane. The ability of some organisms to regulate the fluidity of their cell membranes by altering lipid composition is called homeoviscous adaptation. The entire membrane is held together via non-covalent interaction of hydrophobic tails, however the structure is quite fluid and not fixed rigidly in place. Under physiological conditions phospholipid molecules in the cell membrane are in the liquid crystalline state. It means the lipid molecules are free to diffuse and exhibit rapid lateral diffusion along the layer in which they are present. However, the exchange of phospholipid molecules between intracellular and extracellular leaflets of the bilayer is a very slow process. Lipid rafts and caveolae are examples of cholesterol-enriched microdomains in the cell membrane. In animal cells cholesterol is normally found dispersed in varying degrees throughout cell membranes, in the irregular spaces between the hydrophobic tails of the membrane lipids, where it confers a stiffening and strengthening effect on the membrane. Lipid vesicles or liposomes are circular pockets that are enclosed by a lipid bilayer. These structures are used in laboratories to study the effects of chemicals in cells by delivering these chemicals directly to the cell, as well as getting more insight into cell membrane permeability. 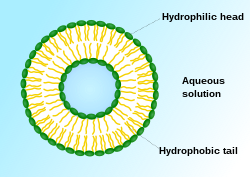 Lipid vesicles and liposomes are formed by first suspending a lipid in an aqueous solution then agitating the mixture through sonication, resulting in a uniformly circular vesicle. By measuring the rate of efflux from that of the insideof the vesicle to the ambient solution, allows researcher to better understand membrane permeability. Vesicles can be formed with molecules and ions inside the vesicle by forming the vesicle with the desired molecule or ion present in the solution. Proteins can also be embedded into the membrane through solubilizing the desired proteins in the presence of detergents and attaching them to the phospholipids in which the liposome is formed. These provide researchers with a tool to examine various membrane protein functions. Proteins within the membrane are key to the functioning of the overall membrane. These proteins mainly transport chemicals and information across the membrane. Every membrane has a varying degree of protein content. Proteins can be in the form of peripheral or integral. The cell membrane plays host to a large amount of protein that is responsible for its various activities. The amount of protein differs between species and according to function, however the typical amount in a cell membrane is 50%.These proteins are undoubtedly important to a cell: Approximately a third of the genes in yeast code specifically for them, and this number is even higher in multicellular organisms. The cell membrane, being exposed to the outside environment, is an important site of cell-cell communication. As such, a large variety of protein receptors and identification proteins, such as antigens, are present on the surface of the membrane. Functions of membrane proteins can also include cell-cell contact, surface recognition, cytoskeleton contact, signaling, enzymatic activity, or transporting substances across the membrane. Most membrane proteins must be inserted in some way into the membrane. For this to occur, an N-terminus "signal sequence" of amino acids directs proteins to the endoplasmic reticulum, which inserts the proteins into a lipid bilayer. Once inserted, the proteins are then transported to their final destination in vesicles, where the vesicle fuses with the target membrane. The sequence of chemical events that led to the first nucleic acids is not known. The polymerization of nucleotides into random RNA molecules might have resulted in self-replicating ribozymes. 1632–1723: Antonie van Leeuwenhoek teaches himself to grind lenses, builds a microscope and draws protozoa, such as Vorticella from rain water, and bacteria from his own mouth. The belief that life forms can occur spontaneously (generatio spontanea) is contradicted by Louis Pasteur (1822–1895) (although Francesco Redi had performed an experiment in 1668 that suggested the same conclusion). 1855: Rudolf Virchow states that cells always emerge from cell divisions (omnis cellula ex cellula). 1931: Ernst Ruska builds first transmission electron microscope (TEM) at the University of Berlin. By 1935, he has built an EM with twice the resolution of a light microscope, revealing previously unresolvable organelles. Mitochondria and plastids are formed only through a process similar to binary fission. In some algae, such as Euglena, the plastids can be destroyed by certain chemicals or prolonged absence of light without otherwise affecting the cell. In such a case, the plastids will not regenerate. They are surrounded by two or more membranes, and the innermost of these shows differences in composition from the other membranes of the cell. They are composed of a peptidoglycan cell wall characteristic of a bacterial cell. Both mitochondria and plastids contain DNA that is different from that of the cell nucleus and that is similar to that of bacteria (in being circular in shape and in its size). DNA sequence analysis and phylogenetic estimates suggest that nuclear DNA contains genes that probably came from plastids. Much of the internal structure and biochemistry of plastids, for instance the presence of thylakoids and particular chlorophylls, is very similar to that of cyanobacteria. Phylogenetic estimates constructed with bacteria, plastids, and eukaryotic genomes also suggest that plastids are most closely related to cyanobacteria. Among eukaryotes that acquired their plastids directly from bacteria (known as Primoplantae), the glaucophyte algae have chloroplasts that strongly resemble cyanobacteria. In particular, they have a peptidoglycan cell wall between the two membranes. Mitochondria and plastids are similar in size to bacteria. 1. Cell with large round size has more chance to survive as compare to thin cell under desiccation, why? 2. What are the difference between Oligosaccharides and Polysaccharides? 3.Which cell did evolve first prokaryote or eukartyote? 4. What is endosymbiotic theory? could it happen present time also if yes then how if not then why not? 5.Which reaction is not possible in biological system? 6.What is the difference between prokartyote and eukaryote? 7.How are the plant cells different from animal cell? 8.Which kind of gases were present before the origin of life? ↑ a b "Right-handed amino acids were left behind". New Scientist (Reed Business Information Ltd) (2554): pp. 18. 2006-06-02. http://www.newscientist.com/channel/life/mg19025545.200-righthanded-amino-acids-were-left-behind.html. Retrieved 2008-07-09. ↑ Kojo, Shosuke; Hiromi Uchino, Mayu Yoshimura and Kyoko Tanaka (October 2004). "Racemic D,L-asparagine causes enantiomeric excess of other coexisting racemic D,L-amino acids during recrystallization: a hypothesis accounting for the origin of L-amino acids in the biosphere". Chemical Communications (19): 2146–2147. doi:10.1039/b409941a. PMID 15467844. ↑ "MICR 425: PHYSIOLOGY & BIOCHEMISTRY of MICROORGANISMS: The Origin of Life". SIUC / College of Science. http://www.science.siu.edu/microbiology/micr425/425Notes/14-OriginLife.html. Retrieved 2005-12-17. ↑ "Early Earth atmosphere favorable to life: study". University of Waterloo. http://newsrelease.uwaterloo.ca/news.php?id=4348. Retrieved 2005-12-17. ↑ Fitzpatrick, Tony (2005). "Calculations favor reducing atmosphere for early earth – Was Miller–Urey experiment correct?". Washington University in St. Louis. http://news-info.wustl.edu/news/page/normal/5513.html. Retrieved 2005-12-17. ↑ Thompson WR, Murray BG, Khare BN, Sagan C (December 1987). "Coloration and darkening of methane clathrate and other ices by charged particle irradiation: applications to the outer solar system". Journal of geophysical research 92 (A13): 14933–47. doi:10.1029/JA092iA13p14933. PMID 11542127. ↑ Hill HG, Nuth JA (2003). "The catalytic potential of cosmic dust: implications for prebiotic chemistry in the solar nebula and other protoplanetary systems". Astrobiology 3 (2): 291–304. doi:10.1089/153110703769016389. PMID 14577878. ↑ Balm SP, Hare J.P., Kroto HW (1991). "The analysis of comet mass spectrometric data". Space Science Reviews 56: 185–9. doi:10.1007/BF00178408. ↑ Bada, Jeffrey L. (2000). "Stanley Miller's 70th Birthday" (PDF). Origins of Life and Evolution of the Biosphere (Netherlands: Kluwer Academic Publishers) 30: 107–12. doi:10.1023/A:1006746205180. http://www.issol.org/miller/70thB-Day.pdf. ↑ Miller, Stanley L. (May 1953). "Production of Amino Acids Under Possible Primitive Earth Conditions" (PDF). Science 117 (3046): 528. doi:10.1126/science.117.3046.528. PMID 13056598. http://www.abenteuer-universum.de/pdf/miller_1953.pdf. ↑ Miller, Stanley L.; Harold C. Urey (July 1959). "Organic Compound Synthesis on the Primitive Earth". Science 130 (3370): 245. doi:10.1126/science.130.3370.245. PMID 13668555. Miller states that he made "A more complete analysis of the products" in the 1953 experiment, listing additional results. ↑ "EXOBIOLOGY: An Interview with Stanley L. Miller". Accessexcellence.org. http://www.accessexcellence.org/WN/NM/miller.php. Retrieved 2009-08-20. ↑ Dreifus, Claudia (2010-05-17). "A Conversation With Jeffrey L. Bada: A Marine Chemist Studies How Life Began". nytimes.com. http://www.nytimes.com/2010/05/18/science/18conv.html. ↑ Oró J, Kamat SS (April 1961). "Amino-acid synthesis from hydrogen cyanide under possible primitive earth conditions". Nature 190: 442–3. doi:10.1038/190442a0. PMID 13731262. ↑ Wilde, Kenneth A.; Bruno J. Zwolinski and Ransom B. Parlin (July 1953). "The Reaction Occurring in CO2, 2O Mixtures in a High-Frequency Electric Arc". Science 118 (3054): 43–44. doi:10.1126/science.118.3054.43-a. PMID 13076175. http://www.sciencemag.org/cgi/content/citation/118/3054/43-a. Retrieved 2008-07-09. ↑ Fox, Douglas (2007-03-28). "Primordial Soup's On: Scientists Repeat Evolution's Most Famous Experiment". Scientific American (Scientific American Inc.). http://www.sciam.com/article.cfm?id=primordial-soup-urey-miller-evolution-experiment-repeated. Retrieved 2008-07-09. ↑ Fahey RC, Newton GL, Arrack B, Overdank-Bogart T, Baley S (1984). "Entamoeba histolytica: a eukaryote without glutathione metabolism". Science 224 (4644): 70–72. doi:10.1126/science.6322306. PMID 6322306. ↑ Badano, Jose L.; Norimasa Mitsuma, Phil L. Beales, Nicholas Katsanis (September 2006). "The Ciliopathies : An Emerging Class of Human Genetic Disorders". Annual Review of Genomics and Human Genetics 7: 125–148. doi:10.1146/annurev.genom.7.080505.115610. PMID 16722803. http://arjournals.annualreviews.org/doi/abs/10.1146/annurev.genom.7.080505.115610. Retrieved 2008-06-15. ↑ Tsai Y, Sawaya MR, Cannon GC, Cai F, Williams EB, Heinhorst S, Kerfeld CA, Yeates TO (Jun 2007). "Structural analysis of CsoS1A and the protein shell of the Halothiobacillus neapolitanus carboxysome." (Free full text). PLoS biology 5 (6): e144. doi:10.1371/journal.pbio.0050144. PMID 17518518. PMC 1872035. http://biology.plosjournals.org/perlserv/?request=get-document&doi=10.1371/journal.pbio.0050144. ↑ Kerfeld CA, Sawaya MR, Tanaka S, Nguyen CV, Phillips M, Beeby M, Yeates TO (August 2005). "Protein structures forming the shell of primitive bacterial organelles.". Science 309 (5736): 936–8. doi:10.1126/science.1113397. PMID 16081736. ↑ Komeili A, Li Z, Newman DK, Jensen GJ (2006). "Magnetosomes are cell membrane invaginations organized by the actin-like protein MamK". Science 311 (5758): 242–5. doi:10.1126/science.1123231. PMID 16373532. ↑ Scheffel A, Gruska M, Faivre D, Linaroudis A, Plitzko JM, Schüler D (2006). "An acidic protein aligns magnetosomes along a filamentous structure in magnetotactic bacteria". Nature 440 (7080): 110–4. doi:10.1038/nature04382. PMID 16299495. This page was last edited on 19 August 2018, at 07:41.